“The Importance of Being Earnest” was the first and is also sadly, the last play to be performed in the basement of Manchester Central Library by The Library Theatre Company. After 58 years in this spectacularly housed library, the theatre is moving. 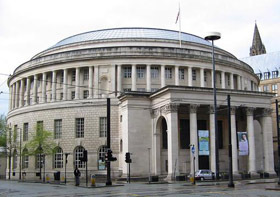 For the next four years while work takes place on a newer and larger venue at the Theatre Royal, the Library Theatre Company will continue to perform at The Lowry Quays Theatre and also put on some exciting site-specific shows in Manchester. A sad but necessary move from what is a beautiful and intimate theatre, in order to increase capacity and improve facilities. So, while you still can and if you admire classical architecture, get there a little early and take a look at this magnificent Grade II listed building, which a little like Wilde himself looks rather grand, but also is not quite as appearances suggest. Giving the impression that it is rather ancient, being inspired by the Pantheon in Rome, the building was actually constructed in the 1930’s but its traditional neo-classical architecture makes it appear much older. After you have taken your eyes off the building, it is well worth venturing inside to see a performance of what Wilde himself described as “a trivial play for serious people” - but don’t worry too much if you’re not the serious type, as it’s not the entrance criteria! 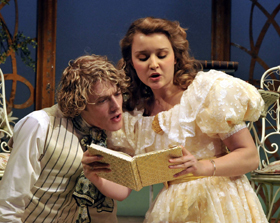 The Importance of Being Earnest is considered by many to be Wilde’s finest play, and it has certainly stood the test of time being as amusing and relevant today as when Wilde wrote it in 1894. Despite considerable changes in society, the upper classes Wilde mocks in this play, are still alive and kicking and still persist in expressing contempt for the lower orders whilst practicing the same tedious and silly little rituals with seemingly nothing much better or useful to do than idling their time away eating ritualistically, drinking copiously and engaging in mindless gossip and regular fleeting affairs of the heart. But before moving on to this rather witty little play about the social foibles of the Victorian leisured classes, it is worth spending a few paragraphs on the writer, he being of course one Oscar Fingal O’Flahertie Wills Wilde, born in 1854. During his lifetime he was known for being as flamboyant as his name becoming one of the most well-known personalities of his day, displaying wit, glitz and a sharp intellect. His greatest talent was for writing and he did so prolifically producing many plays and a string of extremely popular comedies and social satires including “Lady Windermere’s Fan”, “An Ideal Husband” and of course the subject of this review - “The Importance of Being Earnest” which was the last play he wrote. These plays are still performed and enjoyed by audiences today. It was his lively private life and the harsh and discriminatory laws of the time that eventually led to him being sentenced to two years hard labour for what was described at the time as “gross indecency”. His relationships with other men were described as “squalid and disgraceful” in court and he was charged with committing “indecent acts”. Although he suffered for his homosexuality, he never once spoke a single word of regret for it; his private life was his own business, and that’s how it should be. No regret or therapy required. Sadly, upon release with his health and reputation destroyed, and bankrupt, he left Britain for Europe where he died in destitution aged only 46. His witticisms and social commentary are often quoted, and he once famously said “there is only one thing in life worse than being talked about, and that is not being talked about” and I can only imagine that he would be rather pleased to hear that he is still being talked about today. 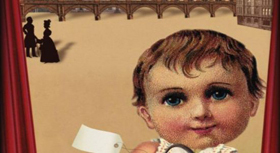 The Importance of Being Earnest is essentially a comedy of manners set in England during the 1800’s and revolves around a pun on the name Ernest, with plenty of word-play and innuendo throughout. Some say the play was simply about earnestness, the kind of false seriousness, priggishness and solemnity which was prevalent at the time, and which Wilde vigorously mocks. However, others say that Wilde was up to his genius comic trickery and that Earnest was a “double-entendre” and “gay-code” for homosexual. Without the knowledge, that there is a sub-text at play, and hidden expressions of gay identity, it would not be too difficult to pick up with the benefit of hindsight. 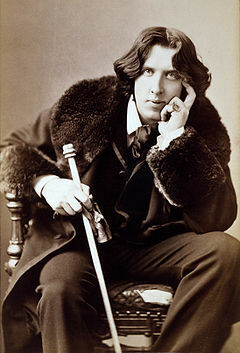 But if your “gaydar” is not fully tuned in to Wilde’s subtleties and the “gay code” of the Victorian era, you could still enjoy the play as a comic social satire as Wilde makes digs at the social conventions and hypocrisy of the time. The play tells the story of four young people who become two engaged couples with a sprinkling of farcical mistaken identity along the way. Both men in the play lead double lives, with two identities, and there are hints, innuendoes and sexual overtones throughout that allude to the possibility of homosexuality, but you could choose to interpret it differently. For example, “I suppose a man may eat his own muffins in his own garden”, a line in the script, is thought by some to be a play on the word muffins, which in Victorian England had certain sexual meaning attached to it. But equally valid is the view that it is simply an observation of the ritual of the afternoon tea-drinking habits of the upper echelons of Victorian society. Earnest was said to be Victorian slang for “gay” and “Cecily”, a character in the play, a trade name of the time for rent-boys. A silver cigarette case features, which was Wilde’s currency for paying off his own rent-boys, but you could simply accept them all in their own right; Cecily as a female name, a cigarette case with no meaning attached and if you didn’t know gay slang for Earnest, you’d still be treated to a rather clever swipe at the upper classes and their activities and mannerisms. Wilde’s script is witty and packed with innuendo, sarcasm and humour which flies at you thick and fast keeping you on your toes in case you miss something. The audience in the Library theatre was mixed, young and old, male and female, but the laughter was consistent and frequent. One particular line brought the house down, it being especially insightful and almost too relevant to believe it was original (but it is, I checked afterwards) – when Lady Bracknell is questioning her daughter's suitor on his potential as a future husband she asks him about his politics, when he replies that he has none really, but that he is a “Liberal-Unionist” she replies “Oh, they count as Tories”. She was hardly bothered by the distinction and how right she would still be today, as it is difficult to see “the join” even now, between any of them. • “All women become like their mothers. That is their tragedy. No man does. That is his”. • “If I am occasionally a little over-dressed, I make up for it by being always immensely over-educated”. • “I never travel without my diary. One should always have something sensational to read on the train”. And too many others to include…. This production by the Library Theatre Company features an eight-strong cast of actors, many of whom are well known to Library Theatre goers, but with some great newcomers. The cast were impressive in their roles, as Wilde’s script is dense, fast-paced and laced with jokes, innuendo and sarcasm, and they didn’t falter. Algernon (played by newcomer Alex Felton) in particular, seemed well at ease in the role of a “relatively impoverished gentleman” living the good life at the expense of relatives and others, moving from country house to city residence in search of dinner and fun. Condensed from four original acts into three, this production was superb! Opening in the morning room of Algernon’s flat in London, the set was elaborate and in keeping with the times and demonstrating the excesses of the upper classes. Luxuriously and sumptuously furnished and decorated, and in the intimate setting of the Library, I almost felt part of the furniture and had to stop myself from walking on the stage, sitting on the sofa and helping myself to tea! With the table laid out beautifully, on the purest linen, the finest china cups, next to perfectly cut cucumber sandwiches and bread and butter - all prepared and served by the butler of course – it was all just a little too inviting! You didn’t have to wait too long either, to be entertained by Wilde’s wit and this splendid cast, and by the end of Act 1, I was thoroughly captivated. 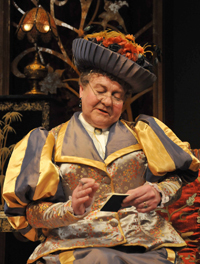 My favourite character was Lady Bracknell aka Aunt Augusta, played admirably by Russell Dixon. Dressed “to the nines” in the most elaborate dresses and flower-filled bonnets, with frills, lace, bows, padding and made from enough shiny fabric to clothe an entire family, with matching shoes, handbags and other “vital” accessories worn by the over-adorned of the time, he managed not to look too camp. How I felt for him in the heat of the small theatre, in such enormous frocks – well done to him for that alone! He has the most characterful face, using expressions of mockery, disgust and contempt to great effect, and ably portraying the petty prejudices of this lady, with just a small wrinkling of the nose, a slight raising of the eyebrows, a straightening of the back or a gesticulation of the wrist. The body language spoke volumes. Lady Bracknell also had some killer lines – as a former teacher, I particularly liked “I do not approve of anything that tampers with natural ignorance. The whole theory of modern education is radically unsound. Fortunately, in England, at any rate, education produces no effect whatsoever”. Although, I can’t quite wholeheartedly agree, I will concede that she does seem to have a bit of a point, but that's maybe the subject of a future Manchester Salon debate so I shouldn’t go into that here. The play is packed with such a lot of clever observations, and this production was most enjoyable. Beautifully presented in a fantastic setting, well-acted and delivered with a cast that gelled together from the outset and with such a marvellously clever and observational script, it can’t fail to entertain. Wilde said that “The only thing to do with good advice is to pass it on. It is never of any use to oneself”. So with that in mind, my advice to you is to take yourself off to the Library Theatre and enjoy an evening full of wit, drama and innuendo and don’t forget to check out the architecture on the way in!